Yes, I DID say it’s a lie. My belief is that God ALWAYS gives you more than you can handle. This past Sunday my pastor made the same point from Matthew 14:22-34. It’s the account of Jesus walking on water. Why not with a word, from the safety of the shore? But He didn’t do any of those things. He sent them INTO the storm, and He left them there, alone, trying to deal with something that was TOO BIG FOR THEM TO HANDLE. 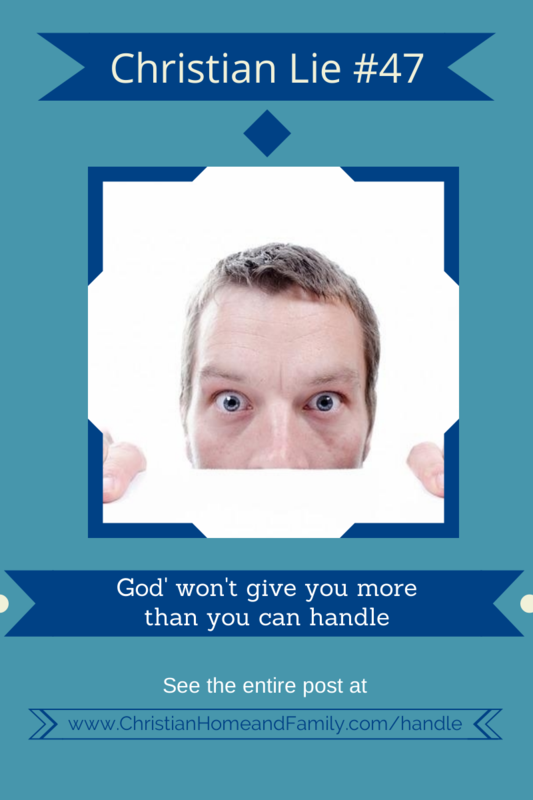 Can you see that the popular idea that “God won’t give you more than you can handle” is a lie? Abraham’s call to leave his home without knowing where he would wind up – Genesis 12:1. Here’s the million dollar question – WHY? Why would our Savior intentionally put us into situations where we are in over our heads? The difficulties we face are for the sake of helping us replace doubt so we can trust Jesus more. Think that through in light of your own experiences. Every, single one of those is a situation that Jesus has put you in, for the sake of giving you opportunities to learn how to trust Him more. Our tendency is to think that what is best for us is what is easiest, or most comfortable, or most personally fulfilling. But Jesus thinks on a different plane altogether. He knows that what is best for us is what will make us more reliant on Him. When you can hold onto the fact that HE IS ALL THOSE THINGS, even when all around you is spinning, you’ll begin to live a life above the waves, above the fears that normally grip you, above the stress and pressure of everyday life. You’ll begin to live as one who is convinced that your great God and Savior, Jesus Christ, is up to good in the world, and in your life. 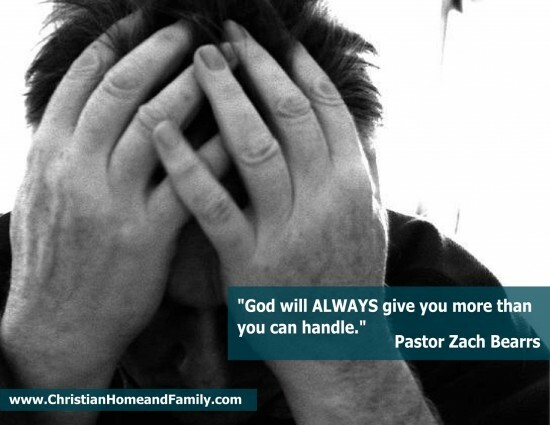 Understanding that fact, how will you change the way you guide your family to understand the “more than you can handle” lie? What can you do to guide them to think according to the truth? How are you going to teach them what the Bible really says about their “over your head” situations? How are you going to encourage them to look beyond the difficulty and stress of the momentary, light affliction they are facing (2 Corinthians 4:17) to see the greater glory that God is working in and through them? You can help them live a life of faith, that pleases God, even in the darkest times. You can, and you should. It’s what Christians do for one another (Hebrews 3:13). There’s more at stake than their comfort or them feeling good. Their faith is at stake. Be proactive on this issue, especially with your kids. If they’re in the church long enough, they’ll hear the “God won’t give you more than you can handle” nonsense. They’ll buy it, just like you did, unless they are taught better, beforehand. Set them strait through patient, bible-based teaching. 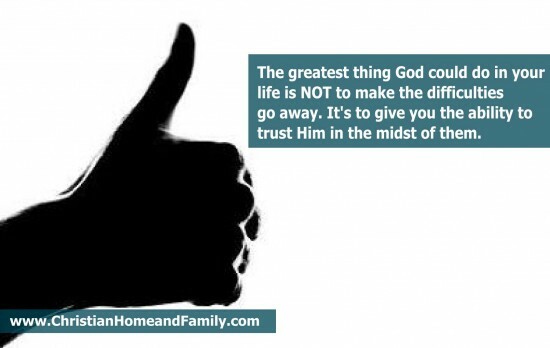 Help them to see that God is SO big that even the hard things don’t phase Him. In fact, He’ll put hard things into their lives for their good, and for His glory. And He’ll pull it all off, beautifully. Here’s a song we sang during worship last Sunday, and it fit wonderfully with the theme. Let the LORD use it to help you accept the fact of His sovereign hand and purpose in the midst of your difficult circumstances. Draw comfort from the fact that HE is bigger than the oceans that threaten to rise against you.